By using the term New Shrubbery I do not just mean adding in a few more shrubs but thinking about how much this useful and sometimes maligned group of plans can add to your garden. I often talk and write about Less Effort Gardening and the benefits of permanent planting to create a year round display. One of the key components of the less effort garden is the use of shrubs, but banish all visions of gloomy Victorian shrubberies or panic at the complexities of pruning. There is now a huge range of shrubs available for every situation and a few key facts can simplify their maintenance. In a traditional mixed planting scheme shrubs are mainly used for structure, the bones of the border if you like, with herbaceous perennials (cottage garden flowers) providing colour and texture to put the flesh on the bones. 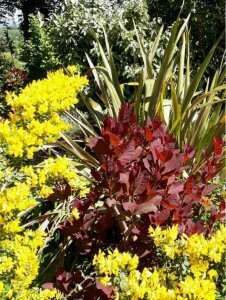 In a New Shrubbery you simply choose a mix of evergreen and deciduous shrubs to provide the colour as well, using coloured foliage as well as flowers. Adding spring bulbs between the shrubs ensures a bright start fo the year. If I could offer only one piece of advice to someone planting a new border in this style it would be “Plant your shrubs far enough apart”. We buy young, small plants and it is easy to forget how large shrubs will grow over the next 7-10 years as they fiil the border out. So stick to the information on the label and plant with room to grow. The whole point of less effort is lost if you are constantly battling to separate plants that are too close together. And this is especially important with trees and shrubs that cannot be lifted and divided as perennials are. Bare soil in the short term can be filled with ground cover perennials such as hardy Geraniums or Periwinkle that can happily be shaded out as the shrubs grow. And so to pruning: many shrubs require very little pruning whilst they grow to the size you want but keep an eye on the shape they are developing into and remove wayward shoots and any that cross into the centre of the plant. This is best done in autumn. Once you want to keep the plant at a stable size, you need to prune annually to remove one year’s growth. And the simplest guide is to prune after flowering to allow the shrub the maximum time to regrow and produce new flower buds. If you have a rare or precious specimen, please check information on pruning before grabbling the secateurs!